For those that done know, Gerritsen Creek is a no wake zone which prohibits Jetskiing, waterskiing, and wakeboarding in the area. Basically no anything of any kind. Jet Ski In Gerritsen Beach from Gerritsen Beach on Vimeo. A lack of a boat prevents me from taking my own pictures but there is heavy equipment on Mau Mau and they are clearing the island. At a cost of $15 Million dollars the New York City Parks Department and the state Department of Environmental Conservation began last month began spraying herbicides on White Island to kill weeds, that will be replaced by grasslands. 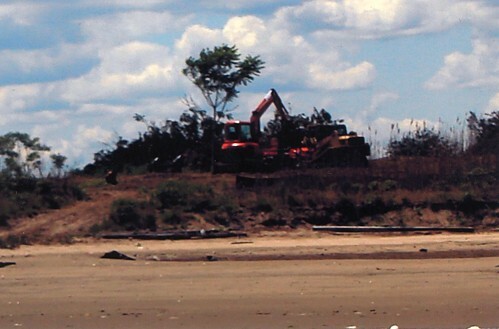 White Island / Mau-Mau is going to be reconstructed via a NYC Parks capital project. The total cost of this project is: $1,155,000. The website has no project description at this time.